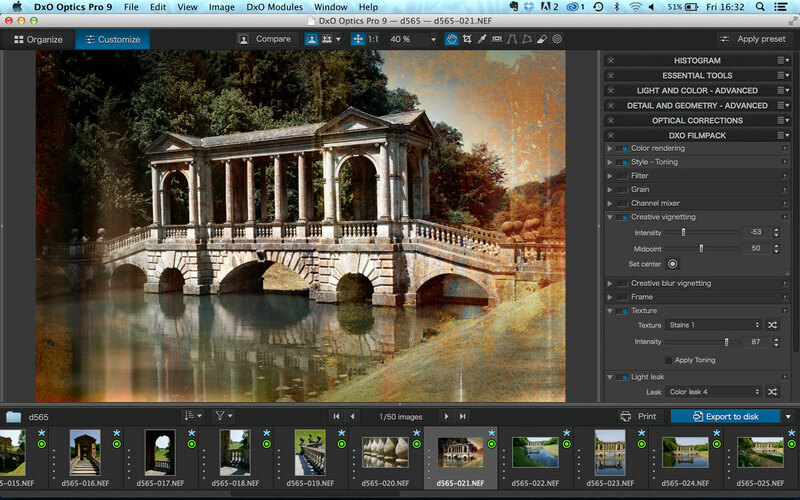 FilmPack 4 is a standalone app which can also work as a plug-in for Photoshop, Lightroom and Aperture. It reproduces the look of old-fashioned colour and black and white films, darkroom effects and retro styles. It comes from DxO Labs, which is best known for its DxO Optics Pro lens correction and RAW conversion program. FilmPack 4 comes in two versions: the Standard version is cheapest but does not offer all the tools of the more expensive Expert version. You can download a DxO FilmPack 4.5 trial version from the DxO website. You can download it direct from the DxO website. The Expert version currently costs £79, equivalent to £130 in the US. FilmPack 4 falls into the category of special effects, so you’d use it alongside Aperture or Lightroom or from within Photoshop, once your images have already been imported, organised and had basic enhancements and/or RAW conversion carried out. It also integrates with DxO Optics Pro, where it can be accessed directly from the tools panels. DxO FilmPack 4 is available within DxO Optics Pro, where it has a panel to itself. FilmPack 4 can also work as a standalone program or a plug-in for Photoshop, Lightroom and Aperture. FilmPack 4 does not have any organising tools, and while you can carry out basic tonal or colour adjustments, though it’s quite likely you’ll have done these already in another program, so these are really just for fine-tuning the finished effect.